Dynamic Air recently purchased two XATS1200 compressors from Atlas Copco Power Technique to replace older same brand compressors for one of their customers in the oil refinery industry. The two new XATS1200 compressors complement Dynamic Air’s extensive Atlas Copco rental fleet of 49 units consisting of eleven different models ranging from the smaller XAS96 to the XAS526 compressors. Dynamic Air, a long-standing key Power Technique customer, is a leading supplier of top quality, cost effective, total compressed air and generator solutions to a wide range of industries in the Vaal Triangle, Nigel, Midvaal and Parys regions. The company’s customer applications range from easy to harsh conditions in industries such as general construction, light demolition, refinery, refractories and iron furnaces. Heroldt says that comparing the performance of Atlas Copco equipment across the range with competitor products, Atlas Copco’s units are smaller, lighter and they deliver more air, power, light, and flow. “The products do what they are supposed to do and more and they do so efficiently! He adds that technology like the FuelXpert for efficiency at partial load and high efficiency screw elements mean more productivity with less fuel costs. Lastly but certainly no less important, Heroldt lauds the Power Technique equipment for its user-friendliness and operator safety and comfort, mentioning that the no frills-no fuss concept of green for go and red for stop makes the operator’s life simple and prevents mistakes. “Our customers hail Atlas Copco products for their durability, efficiency and overall low cost of ownership. Understanding the value that Atlas Copco products add to their business, our customers would rather wait for a shipment than go for a competitor product. There’s simply no looking back once you experience the value that the products offer! 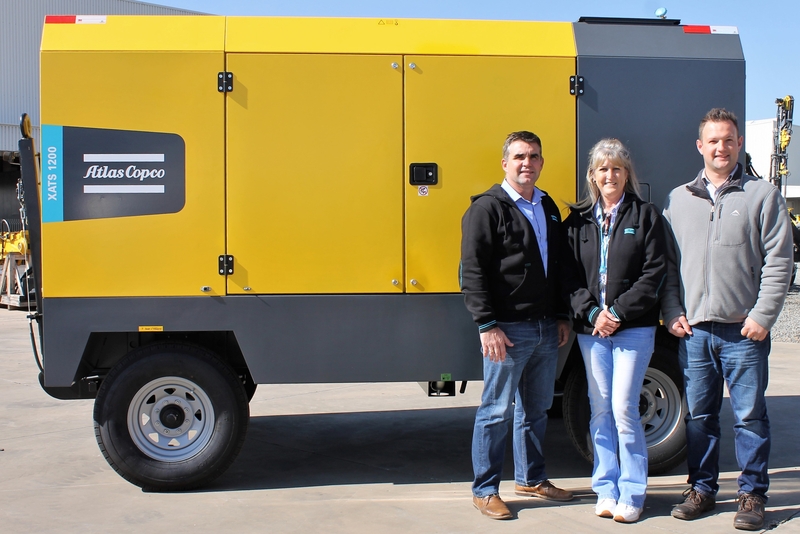 Added to this, the availability and on-time delivery for critical and service parts gives Atlas Copco a massive competitive advantage. We can always count on Atlas Copco’s service team who is readily available to lend on-time assistance to our customers. We are a proud Atlas Copco dealer,” concludes Heroldt. With service intervals of 500 hours, an integrated optimised air filtration system and a dedicated service door for convenient oil level observation and oil filling, service on these large compressors cannot be simpler. “For customers like Dynamic Air with a competent team of technicians who are capable of servicing and repairing our machines and who understand the importance of using only genuine parts, we are happy to take up a support function only,” says Stanford. In addition to providing training during product hand-over, Dynamic Air technicians have access to comprehensive year-round product and technical training. Power Technique’s comprehensive product offering of compressors, generators, light towers and pumps deliver mobile on-site power solutions to the construction, mining and rental industries.